One of the best sprinters to come out of the Golden State, Nate Koch is known around the world as the crowd favorite among the gladiators of the sport. Whether he’s hurtling from behind in a 50 mph sprint finish or diving down the banking to catch the others by surprise in London, Berlin or Carson, the Nater knows what the public wants to see in a sprinter: speed, power and caginess. 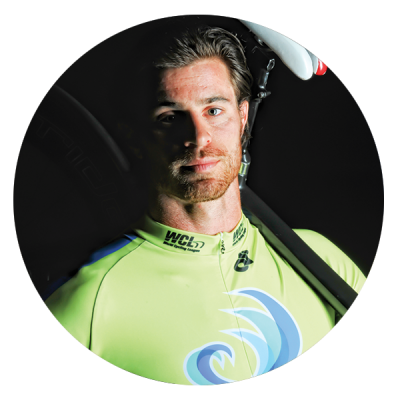 A former scholarship decathlete at Cal State Long Beach, Nate found cycling and track sprinting at a relatively late age but quickly used his explosive style to make the USA National team where he has collected National Championship and Pan Am medals in the sprint and kierin events. Hands down the biggest fan favorite with fiery charisma that will ignite the home crowd.